If you are missing a tooth or series of teeth, all-porcelain dental bridges can offer the ideal solution. At our Decatur Georgia (DeKalb County service area) practice, we place dental bridges that provide a natural appearance, reduce a patient’s risk of gum disease, and correct speech and bite difficulties. In addition, dental bridges eliminate the possibility that your remaining teeth will shift to fill the gap left by a missing tooth. Dental bridges consist of a custom-made false tooth supported on either side by one or two porcelain crowns, or composite bonding material. The dental bridge is used to aesthetically eliminate the gap left by a missing tooth, giving the patient a decade or more of comfortable wear and beautiful smiles. With a traditional fixed bridge, the replacement tooth is held in place by two crowns, and the bridge is only removable by a dentist. A resin-bonded bridge is ideal for front teeth and in situations when the surrounding teeth are healthy, with no large fillings. Cantilever dental bridges are used when there are teeth on only one side of the gap. Dental bridges, regardless of type, are placed in two visits. In your first appointment, Dr. Gary Simms will prepare the teeth surrounding the gap, then take an impression and place a temporary bridge. The impression is used as a guide for the crafting of the bridge’s false tooth and crowns. 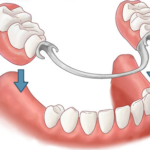 You will wear the temporary bridge until your next appointment, during which your permanent bridge will be cemented into place, fitted, checked, and adjusted. At Metro Decatur Dental Group PC, you can be sure that all the dental bridges we place are longwearing, completely natural looking, and comfortable. To learn more about the advantages of dental bridges, contact Metro Decatur Dental Group PC today (404)-292-3133. Our crowns are essentially a type of dental restoration which completely caps a tooth or dental implant. Now, with “same day” crown service, you can enjoy the ultimate in convenience. No more waiting for the permanent crown to arrive, or dealing after a while with temporarily dislodged temporary crowns. Ask us about this important new service.